In celebration of the Philippine National Autism Consciousness Week (NACW), Autism Society Philippines Board of Trustee Gina Luna-Bermudo helped organized “Autism Angels Take Flight” – a project that aims to help improve the ability of Airport Ground Personnel and Airport Staff in understanding the needs of families traveling with a person with autism through a sensitivity training and to familiarize persons with autism and their families on the sights and sounds of an airport through a pre-flight rehearsal or airport familiarization tour. Taking a child with Autism on a plane ride requires a tedious process of preparation. Changes in routine, unfamiliar surroundings, hypersensitivity to noise, bright lights, and large crowd can be overwhelming for these children causing sensory overload that can trigger uncontrollable meltdowns. As a result, many families with children in the spectrum are hesitant about flying because they are not sure on how their children will react to different stimuli. The social encounters entwined in the numerous layers of traveling are too complex for a child with autism to deal with. The constant fear of eliciting a response from other travellers makes it more difficult for the members of the family to enjoy the journey. To help desensitize these families and Persons with Autism to various sights and sounds at the airport that can prompt socially unacceptable behaviors, ASP partnered with Saudi Arabian Airlines (Saudia) thru the generosity of Station Supervisor Ramon de los Reyes, Customer Service Agent Cynthia David and other Saudia Ground Staff; MIAA Authority, and Bureau of Immigration to give the participants the opportunity to a pre-travel experience thru a simulated airport familiarization tour. 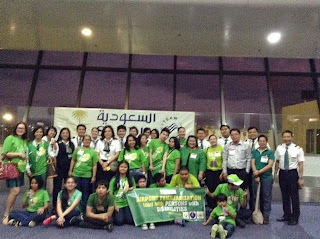 Fifteen Persons with Autism (PWA), mostly from Paranaque chapter, and their families were given the opportunity toe experience travel from departure to arrival. To make the event more realistic, each of the children was given a photocopy of a passport to present when needed. The simulation began at the check-in counters where a boarding pass was obtained with their printed names, destination and departure gates. This was followed by pretending to pay airport fees at the terminal fee booth; queuing at the immigration counter while their photocopied passports and other travel documents were marked with a departure stamp; going thru another security check by putting their bags in the x-ray machine, and finally observing the boarding procedure at the departure gate. The close proximity to the parked aircraft allowed the participants a full view of the humungous Boeing 747-300 Saudi Arabian Aircraft parked at the tarmac. Visible from the cockpit were the Captain and the First Officer who gamely waved at the children while performing their pre-flight procedures. While waiting for the aircraft to push back, Saudia surprised the participants by serving “Autistic Meals” specially prepared by the airline catering department for passengers with Autism. To end the Airport Familiarization Tour, Saudia Ground staffs distributed airline give-away kits containing backpacks, pens, baggage tags, and key chain to the PWAS as souvenirs. It was a fun filled experience that will definitely leave an indelible mark in the minds of the PWAs and their families. The event also gave the Airline Industry, Government sectors concerned and other personnel the opportunity to observe, interact and deliver their services in a structured, learning environment. By understanding these growing communities of travelers, their needs can now be properly addressed giving them not only a safe trip but a happy trip for everyone. About the contributor: ASP Trustee Gina Luna Bermudo is a former international flight attendant and is a frequent resource person for airlines to improve service for passengers with autism. She graduated from Ateneo de Manila University with a Bachelor of Science Degree in Mathematics, major in Computer Science and is currently taking her Masters Degree in Special Education at the University of the Philippines, Diliman, Quezon City.